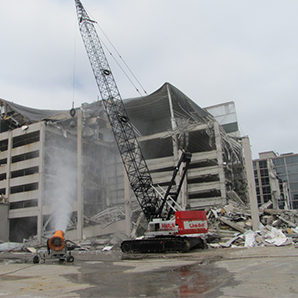 As Demolition Pro USA is providing idealistic demolition services to the clients with complete safety measures; we are also working closely with the commercial sector. The safer commercial demolition is one of our core objectives, which is completed as per the governmental standards. We are solely dealing with all nature of projects, from smaller scales commercial projects and large scale commercial buildings. The safety is keenly observed to provide the highest standard of services to our valued clients. We also believe in finding creative and environmentally sound ways to help achieve our client’s goals. ​The demand of commercial demolition is increasing as most of the clients are eager to develop their offices in a customized way. With each project, we also strive to minimize waste by maintaining a higher volume of recycling. Therefore, Demolition Pro USA is working in the market with its complete potential for serving the commercial clients in terms of demolition.